… is to provide training and education, encourage personal growth, and promote a peer network in the records and information management field. Meetings and programs are normally held in Tacoma and Olympia, Washington, and are open to both current and prospective members. Join our mailing list to receive invitations and updates by email. Visit ‘Soundings’ or view the sidebar at right for recent posts, updates, and past newsletters. The Puget Sound Chapter of ARMA International was chartered in 1976. Our members hail from around the entire Puget Sound area and represent public and private sector records management professionals, vendors, and others interested in the field. Browse our page to learn more about becoming a member, register for meetings and programs, and get links to helpful resources. After taking a couple of months off for summer relaxation (here’s hoping you got some down time! ), we are getting ready to kick off another round of programs! More details and online registration coming soon – be sure your newsletter contact info is updated (or sign up now) for future program notifications! Programs are typically held in Tacoma (at La Quinta Inn & Suites) and in Olympia (at Mercato Ristorante). Details will be posted to each event / registration form on our website as available. The final program of the 2017-2018 ARMA Puget Sound Chapter year is coming upon June 13! We hope many of our members and other records management professionals in the area can join us to celebrate, connect, and learn together. Register online today. Along with an educational program, we’ll recognize chapter members with awards and tenure certificates, and take time for dinner and networking, too. Ever feel like going postal due to volumes of email and not being able to find what you need? Presenting a case study moving from Exchange Outlook to Office 365 and capitalizing on the new features available to better manage email. This case study will address the problem of too much email and ineffectively addressing retention. You will learn how we managed this project and changed our culture to get user buy-in and implemented an effective Email management strategy. From file plan creation to pilot, you’ll learn how to create a roadmap for the project, create retention policy and develop training and communication for users. Speaker Bio: Catherine Wilson has been an Information Governance and RIM professional for over 20 years. Currently she is the Corporate Records Manager for Mutual of Enumclaw Insurance Company and developed the RIM program in its entirety. Previously, Catherine was the Global Records Manager for Hewlett-Packard Company. Catherine has been an ARMA member since 1998 and served on the Board of Greater Sacramento Capitol ARMA Chapter as Program Director, Secretary and Membership Committee Chair. She is now an active member of the Puget Sound Chapter and served as President, Vice President and Program Director. Catherine is a Certified Records Manager (CRM) is ECMP certified and working towards her IGP. We’re excited for upcoming program on May 9th. We’ll hear from Thom Whittemore about the far-reaching impacts of international data protection regulations on our industry. General Data Protection Regulation (GDPR) compliance is a top priority for companies doing business in the EU, but GDPR has far-reaching implications around the globe. Complying with the GDPR will require a company to reach into its Information Technology, Records Management, and Line of Business functions to make compliance a reality. the role of RIM in GDPR compliance. Thom Whittemore is a Principal with Iron Mountain Advisory Services and has more than 13 years of experience in the field of records management. Working with clients in the private and public sectors throughout the United States, Canada, United Kingdom, and other countries, Thom has developed compliant Records and Information Management Programs across a variety of industries and companies. His work includes policy and records retention schedule development, global program development, information governance consulting, and privacy compliance solutions. The Washington State Archives offers free Records Management trainings throughout the state and on their website. Announcing a change in the program topic for May 9, 2018. We are excited to announce that Tom Whittemore from Iron Mountain will be presenting on data protection and privacy law including GDPR and European Union privacy regulations. More details coming soon, but you can register today! Are you enrolled in (or thinking about) heading back to school for a graduate degree? If so, scholarships are available! ARMA International Education Foundation graduate scholarships are available to aspiring information management professionals currently enrolled in accredited graduate-level education programs. This year AIEF will award several scholarships ranging from US $1,000 to $3,000. The application deadline is March 30, 2018 at midnight (EST). For questions or inquiries, please contact Deb Marshall, Foundation Coordinator at coordinator [at] armaedfoundation.org. 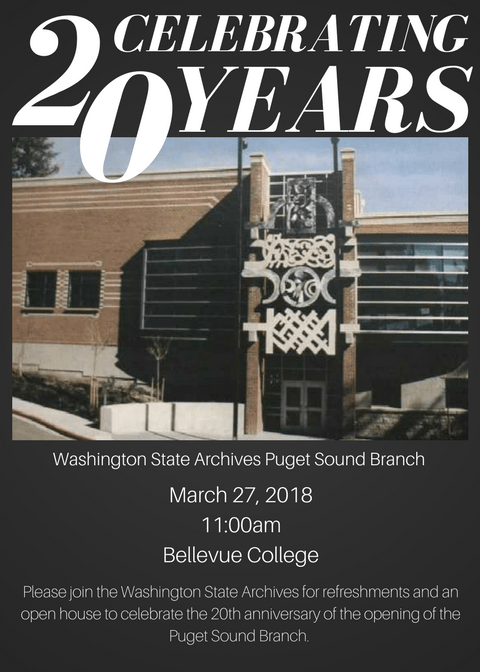 The staff of the Washington State Archives Puget Sound Branch sent an invitation to an open house celebration of their 20 years on the campus of Bellevue College. The event will include refreshments and tours! This is a non-ARMA event that may be of interest to members in the region. If you haven’t been to the Puget Sound Branch Archives recently, be sure to use the directions attached below because the specific location on campus cannot be mapped or tracked by GPS. The College will be on Spring Break at that time, so there will be plenty of parking, with no permit required, and, it will be easy to get in and out of campus.